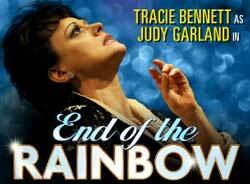 Tony and Olivier nominated End Of The Rainbow starring Tracie Bennett gives behind-the-scenes look at the final months in Judy Garland's life has extended its Broadway run to January 6th 2013. The show played in London and went on a UK tour before transferring Broadway in March with Bennett receiving rave reviews for her tour de force performance. And it looks as though it will be some time before we see her back in the UK as she is staying on in the US to also go on a national tour which starts on March 2013.